The Local Organising Committee for the Congress 2018 with Co-Congress Director Orhan Ercan in the lead has already worked intensely on the preparations for the FIG Congress 2018. The preparations for the FIG Congress 2018 are already progressing rapidly. The local organising committee has worked intensely on the preparations, hereunder to inform about FIG and the Congress widely withn Turkey and around and to involve national partners for the congress. Local Organising Committee Congress 2018 together with FIG Vice President Rudolf Staiger and Director Louise Friis-Hansen. In the middle Vice President Turgay Erkan and Co-Congress Director Orhan Ercan. FIG Vice President Rudolf Staiger and Director Louise Friis-Hansen met with the local organising committee to further discuss the preparations hereunder a discussion on the selection of the best possible venue for the Congress. Co-Congress Director Orhan Ercan chaired the meeting efficiently and inspiringly, and an exciting programme for the Congress is on its way. FIG Congress 2018 will be an exciting week long event taking place 6-11 May 2018 with many various activities going on throughout the four conference days 7-10 May. Some pre-events are also being scheduled on 4 and 5 May. Istanbul is a fascinating city that stretches along the two shores of the Bosphorus linking the Sea of Marmara in the South with the Black Sea in the North. 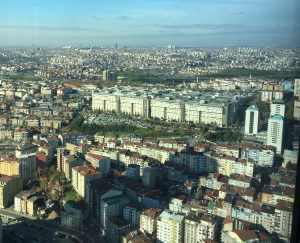 It is Turkey’s largest city with a population of approximately 12 million. The city is expanding rapidly, and there is quite much construction work going on these years which raises interesting issues for surveyors. Istanbul connects east and west and is easily accessible from most places around the world, which makes it highly qualified as destination for a FIG Congress. As a supplement to the technical programme there will also be various technical tours and also social arrangements such as welcome reception, Turkish Evening and a Gala Dinner, all in spectacular places that show the Turkish culture from its most charming side. The internal agreement between the local host, The Chamber of Surveying and Cadastre Engineers of Turkey, and FIG was signed by Vice President Turgay Erkan, and FIG Director. The call for papers for the technical programme will be announced later - but you can already prepare for your paper. Again for the Congress 2018 there will be a special call for peer reveiw papers.